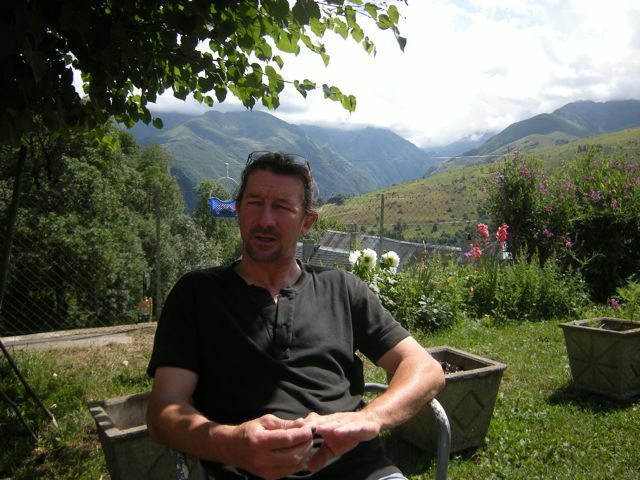 While in the Pyrenees, Miles Joris-Peyrafitte (my younger son) and I have two gigs at the mountain resort of Peyragudes. Our first one was last Thursday and the next one is this coming Thursday (08/13/09). Peyragudes is located at the top of the Peyresourde pass (If you follow the Tour de France bike race you might have seen this breathtaking valley on TV, the pass has been part of the race since 1910). 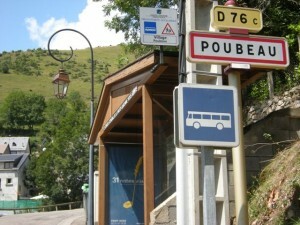 When we drove up for tech rehearsal Miles noticed a road sign pointing to “Poubeau”. 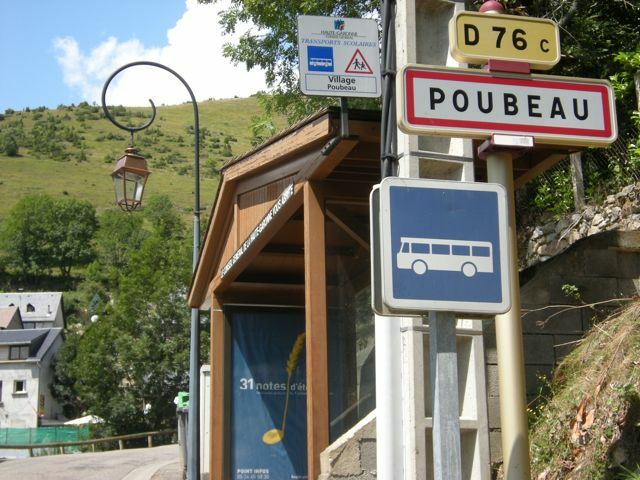 He asked me if this village was related to the Poubeau cheese. “Yes Miles! and if we have time we should stop on our way down” I replied. Thanks to my brother Jean-Louis’ efficiency our session was smooth and short and we could stop in Poubeau on the way down. 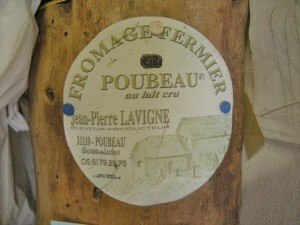 Miles grew up with the Poubeau cheese mythology. One year my mother managed to fool the US customs and sent an entire wheel through the mail for Christmas – that was before September 11th 2001. Another year our friend Eric Paul, then in charge of the dairy section at the Albany Food Coop, was determined to import Poubeau cheese. A cheese distributor assured him he could get him some. Twice Eric called to urge me to come to the coop; the shipment had arrived and I should be the first tasting the Poubeau cheese. 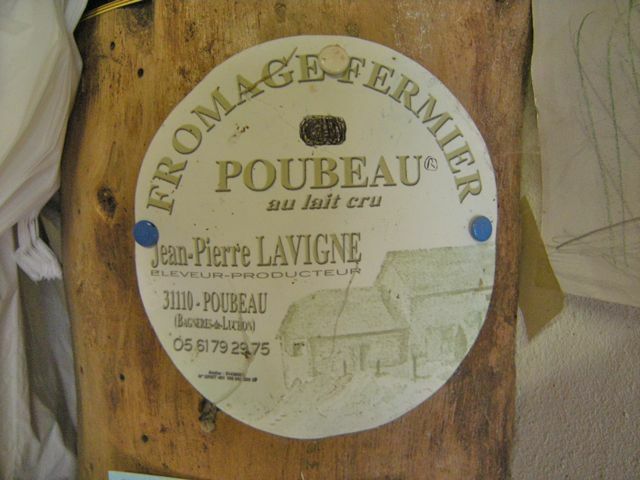 Sadly I had twice to tell him that it was not Poubeau cheese but a generic pasteurized Pyrenean cheese that was not remotely close to the Poubeau. I told the story to Jean-Pierre and he confirmed that there is no way his cheese could travel overseas via a distributor. As a matter of fact, he is not allowed to sell his cheese beyond a 80 kms radius. He went on to explain that his operation functions with a special dispensation. His mode of fabrication doesn’t comply with all the super cumbersome European Union norms. He sells about 1700 cheeses a year, mostly at the farm. He has 2 retailers in the town of Luchon and a couple of restaurants in the area. Jean-Pierre minds a herd of 14 Brown cows and makes cheese every other day, he has one helper coming a few hours a day and hopes to be able to take one day a week off, once Gabriel –the new helper- is trained. In winter, when the cows are stabled for most of the day, he supplements his income working at the Peyragudes ski resort. He works has a ski patrol/rescuer and loves the change of pace and action on the slopes. When Pierre and I went back to take pictures and talk to him I should have asked more practical question on how to make the cheese but we started reminiscing about the past and Jean-Pierre’s loved sharing his salsa dancing passion. One of thing we discussed though was that due to the lack of land available in the area, he had to buy land 70 kms away to be able to make enough hay to feed the cows in winter. The land that could be available for farming is slowly being taken over by the more lucrative business of tourism and second homes. In order to buy the land mentioned above he went to see his banker to get a loan. The banker was being very demanding in terms of guarantees. Jean-Pierre appropriately pointed out to him that if he would walk right into a car dealer’s lot he would get instant credit to buy a 30 000 euro car (same amount of the loan he needed to purchase the land). How come he could get a car in one afternoon and not get land to feed his cows? It is not an easy life to be a farmer anywhere, but it sounds like the European system is applying a lot of the agri-biz policies the U.S is trying to recover from. One hope though is that José Bové was recently elected at the European parliament and is working on agricultural issues. A fresh and clean cow milk taste, with a complex nutty undertone. The texture is supple and subtle. 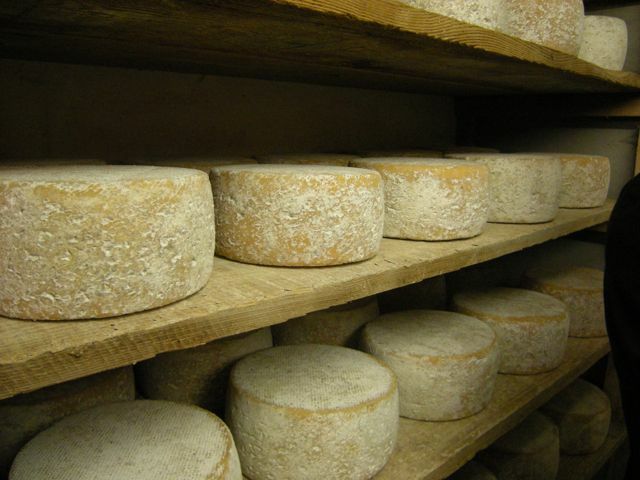 The rind is not too thick and I always eat it —I like tasting the mold of the aging layers. I enjoy reading your articles on food. Thank you for sending this blog to me, for mentioning my history as a cheesemonger and my earnest efforts to get your beloved cheese from Pubeau. I would love to try it again. I have held onto all the information about the cheeses and fruit preserves you asked me to get for you for a time when I am buying and importing again…. Another friend of mine from Lyon was also telling me about agribusiness in France and how things are changing. It was very upsetting….